Picking up where our SWA1501 leaves off, the Mackie SWA1801z ups the ante with even more wattage and a bigger 18" transducer. The SWA1801z features an internal 800-Watt FR (Fast Recovery) Series amplifier and a high-precision 18" transducer custom designed for optimal performance with the amp and enclosure. 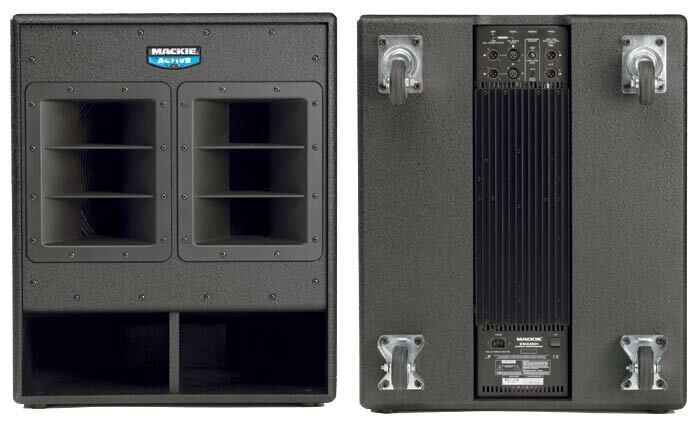 Onboard Mackie Active electronics ensure seamless integration of the amplifier and transducer at all times, creating a system that is highly efficient and versatile. Add it all up and this high-output system will peel the paint right off the walls! Active doesn't just mean the SWA1801z has an amplifier bolted on its back ? it means optimized electronics that provide complete control and maximum performance over all components. The onboard Active system controls the crossover filters, equalization, protection for the transducer and electronics, and provides real time vigilance over the entire system. There is simply no way that you can get this kind of full system functionality by strapping an amp on the back of a passive speaker box. Connecting and setting up the SWA1801z is a breeze. It accepts a stereo or mono line-level signal via female XLR input jacks. Male XLR Thru jacks are provided for daisy-chaining the signal to additional SWA1801z cabinets. The built-in crossover routes the high frequency content to the high-pass output jacks, which can be used to feed the inputs of full-range Active speakers, such as those in the Mackie SAz Series, or an amplifier powering a pair of passive speakers. A Subwoofer Level control lets you adjust the balance between the subwoofer and the full-range speakers. The SWA1801z's built-in amplifier, which produces 800 watts continuous power, sits on a massive heatsink, eliminating the need for fans and dramatically extending life expectancy. A tremendous benefit of having the amplifier inside the subwoofer enclosure is that the SWA1801z functions as a complete system, optimizing acoustic, electronic, and mechanical designs to achieve the highest level of performance and value. For high-output loudspeakers, real wood just sounds better?and it looks better, too! The SWA1801z enclosure is made of select 15mm Baltic birch plywood and finished in black splatter paint. Carrying handles are integrated into each side for easy loading, and casters are attached to the rear for transport. Since you will probably want the full-range enclosure nearby, a pole mount receptacle is strategically placed on top of the enclosure.